Arctic Wave Glider temperature section obtained on 1-4 August 2011 on the shoreward boundary of the Mackenzie River plume at 1478W. The Arctic Climate Dynamics group conducts observations and evaluates models of Arctic sea ice to document and predict climate change impacts on Arctic marine ecosystems. The group is also documenting Bering Sea changes, where research suggests a shift from predominantly interannual variability to decadal variability. Climate change in the Arctic presents a need for expanded research in support of NOAA’s climate program. The Arctic has evolved to a “new normal” that lies outside the bounds of recent natural variability. Opportunities for the Arctic Climate Dynamics group include: developing new capabilities for NOAA sea ice forecasting on weekly, seasonal, and decadal scales; providing baseline observations for the Beaufort and Chukchi seas; detecting and predicting changes in physical, chemical, and biological structure and dynamics in the U.S. Arctic marine environment; evaluating the potential for strengthened linkages between Arctic climate change and mid-latitude extreme weather events; and determining causes and estimating future impacts of changes in atmospheric composition and radiative fluxes. The Arctic Climate Dynamics group provides scientific support for decision makers on climate change and ecosystems in the Arctic and sub-Arctic, leading projects on: historical climate changes, climate and sea ice projections in northern latitudes mid-latitude linkages, ecosystem indices in the Bering Sea, and the Arctic Report Card and Sea Ice Outlook Websites. The group has contributed to the government response to the Endangered Species Act listings for polar bears, ribbon seals and spotted seals, to the NOAA Arctic Action Plan, and to the Arctic Transportation Study. The group supports the Arctic Council and the International Arctic Science Committee on Arctic Climate Change, and advises NOAA fisheries managers on climate change issues, which in turn helps set fisheries quotas for the Bering Sea. 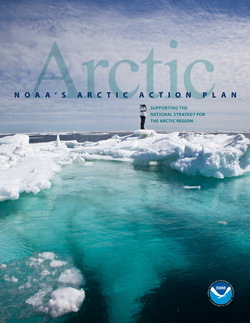 NOAA Arctic Action Plan. Download PDF.